What are some of the diseases carried by ticks and mosquitoes ? 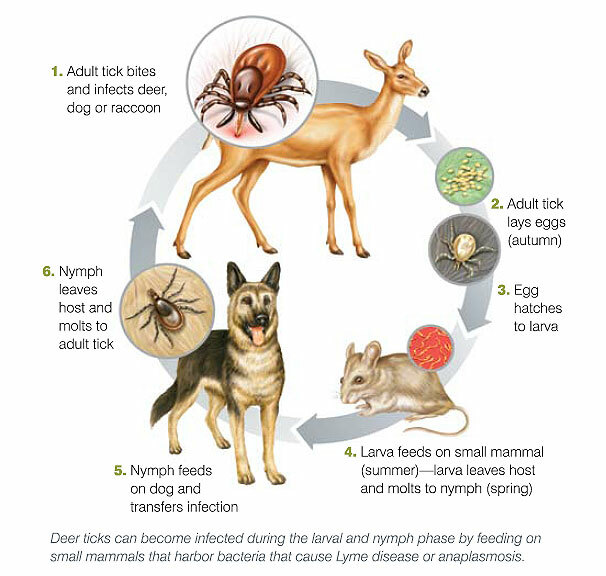 • Lyme disease is transmitted by the deer tick or black-legged tick and can be found in every U.S. state and Canadian province. Dogs are 50% more likely than people to contract Lyme disease. Click here for additional information. brown dog tick. Click here for additional information. Ehrlichia ewingii which is transmitted by the lone star tick. Click here for additional information. • Heartworm disease is transmitted by mosquitoes. Despite high awareness with pet owners, infection rates haven’t changed in 10 years. Click here for additional information. 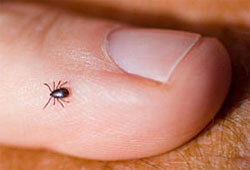 •Ticks and mosquitoes often carry parasites and bacteria that cause disease. They can be transmitted to your pet if an infected tick or mosquito bites them. • Your dog can be exposed to infection in almost any outdoor location where ticks and mosquitoes can be found, and risk varies from region to region. • Your pet may not show any immediate signs of infection, making diagnosis difficult. Testing is the only way to know for sure if your dog has been exposed. lameness, swollen or painful joints, lack of energy, loss of appetite/weight loss, vomiting, diarrhea. • Check your dog for ticks daily. If you find a tick, go to dogsandticks.com for proper removal procedures. Call your veterinarian for assistance and to schedule a follow-up visit. • Bring your dog in for a vector-borne disease screening at least once a year. If infected, regular testing can provide early detection, which can improve your dog’s prognosis. Here, at Neumeister Animal Hospital, we encourage our clients to bring in stool samples from their pets on a yearly basis, so that we can check it for parasites (or parasite eggs) under a microscope. This way we can treat the pets early on, even before they get ill. 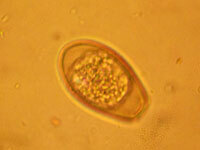 Most commonly we will find roundworm- or tapeworm eggs, but there are many other parasites as well. 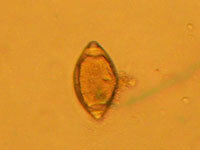 Coccidia are one-celled organisms that live in the intestinal tracts of dogs and cats. They most commonly cause disease in puppies and kittens or adult animals who are stressed in other ways. Coccidia can cause severe, bloody diarrhea which results in dehydration and even death.Any infected animal is contagious to others of the same species. drugs that inhibit the reproduction capabilities. It usually takes drug treatments of one to three weeks. Whipworms can cause mucoid and bloody stool or diarrhea. The diarrhea is often accompanied by urgency and straining. Dogs with a heavy infestation may lose weight, fail to thrive, and develop anemia. The frustrating aspect of whipworm infections is the high rate of re-infection because the eggs are very resistant and can live in soil for years, even resisting freezing. After initial treatment we advise to use a heartworm preventative that contains a whipworm medication.